Properly fitting golf gloves will improve your ability to grip the club and reduce slipping during the swing. One of the most used golf accessories is the glove. Golf gloves are worn to provide additional comfort and feel for the golfer while preventing blisters and helping control moisture when playing in warm weather. A quality glove also will help reduce slippage and preserve your grip on the club. When you are looking to purchase a good glove, the most important factor is how the glove feels on your hand when you are playing. Assess your hand size by using a golf-glove fitting chart at your local pro shop or golf apparel store. If you are a right-handed golfer, you normally will wear a glove on your left hand, and vice versa. There are different sizes for men, women, juniors and children. Choose between synthetic and leather for the material of your golf glove. Modern synthetic materials often feel softer than leather. Try both types to determine the most comfortable material. Assess the feel of the gloves you are considering. Pay attention to gloves that are too tight or too loose fitting. 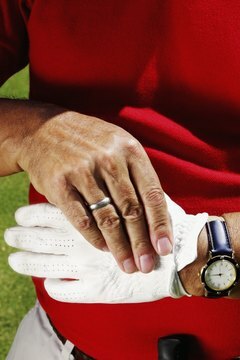 Gloves that fit too tightly potentially will distract you over the course of a round, and those that are too loose may result in the club slipping from your hands. Ensure that the glove's material does not extend past your fingertips when trying on the glove. This is an indicator the glove is too large. Request permission from the store's sales clerk or manager to try the glove while hitting practice balls on the range or in a retail outlet's practice area. Some stores may not permit you to test the glove, or they will allow you to hit only a certain number of balls. Fit Golf for Women: Women's Golf Gloves: Which are the Best?